The handpiece was developed for treatment of mild to moderate acne vulgaris on skin types I-V. The handpiece emits a blue wavelength at the range of 420 – 755nm. The handpiece’s software allows you to choose from three types of DPC pulses- smooth, long or high. The default pulse parameters automatically select the ideal treatment settings based on the type of acne and the skin type, yet you can manual choose the settings. The AC 420 handpiece has a spot size of 3.4 cm2 and its fluency ranges from 5-15 J/ cm2. It is equipped with a Sapphire contact cooling tip which protects the epidermis and which has three modes of operation- high, low and off. 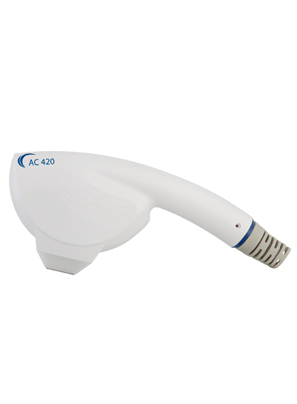 The AC 420 has been ergonomically designed for quick and easy treatment delivery.